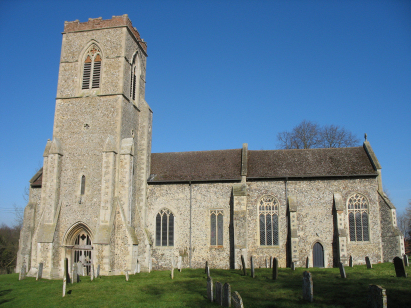 The parish of Hardingham lies in central Norfolk, about 5 miles northwest of the market town of Wymondham and northeast of the substantial village of Hingham. The village lies in the lanes west of the junction of two B roads the B1108 which links Norwich to Watton and the B1135 which links Wymondham to East Dereham. This area is a broad agricultural plateau roughly 50 metres above sea level and dominated by arable farmland. A scatter of lanes runs through the big fields under wide open skies. The village of Hardingham has all the characteristics of a settlement that has migrated through time, it is over a mile southeast of where its mediaeval forebear was probably located. The presence on the map of both "the Hall" and "the old Hall", the latter close to the church is perhaps indicative. 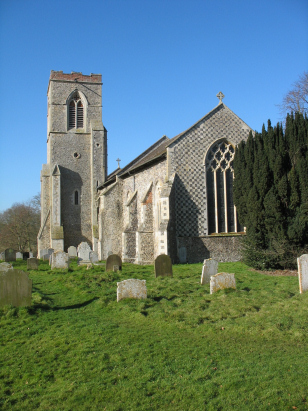 St George's church is physically closer to the neighbouring village of Reymerston than to Hardingham. St George is predominantly of the 13th century though there is evidence of rework in the 16th and no doubt the Victorians had their usual dabble. Pevsner is suspicious of the chequer-patterned east wall which is clearly not original and the brick top to the tower shows as rework or addition. As stated the church is roughly a mile northwest of the village and stands close by the Old Hall, the church being set back (north) of a relatively minor lane heading east-west. Two standard 800-entry register books cover the period of the transcript which the second continuing beyond to 1939. Both registers are filmed on Microfiche 6 to 8 in the collection of the Norfolk Record Office and from which this transcript was prepared. The fiche are elderly and the images do not show the quality to be expected, however the registers must have been in excellent condition and well written as despite the image quality this proved a straightforward transcript to prepare. Hopefully few errors will have crept in to its production.